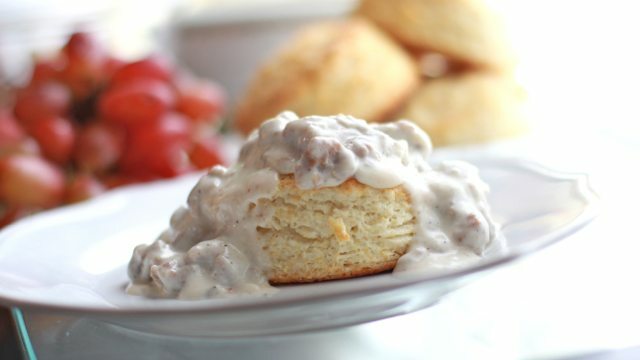 If there is one breakfast food that screams down south eating, it’s southern sausage gravy with fluffy buttermilk biscuits baby! Even though I only make this a few times a year it’s still one of my favorite breakfast foods. There’s something special about having sausage gravy and buttermilk biscuits in the winter time. It’s such a cozy, comforting and filling meal. 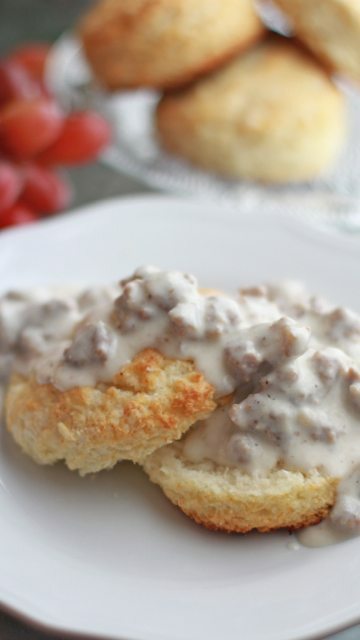 Growing up, when my mother use to make sausage gravy, she would make a pan of sheet biscuits to save on time. I still remember those perfectly cut square biscuits! 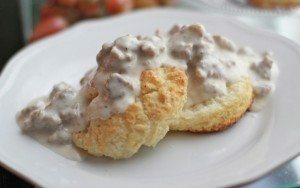 I’m still hunting for that sheet biscuit recipe like she use to make but I do have her simple and easy southern sausage gravy! 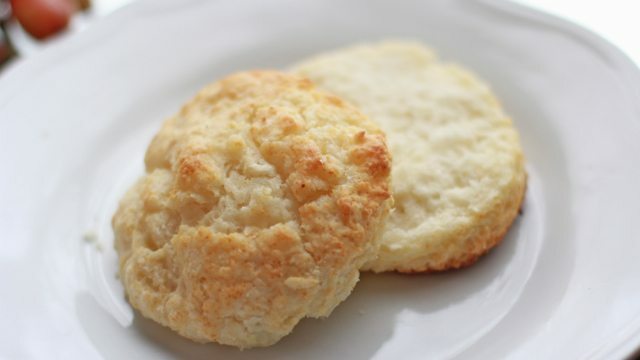 The biscuits I’m using in this recipe is awesome nonetheless! You can find the detailed post & video I did on these easy southern buttermilk biscuits right here. They are so fluffy, thick and buttery! 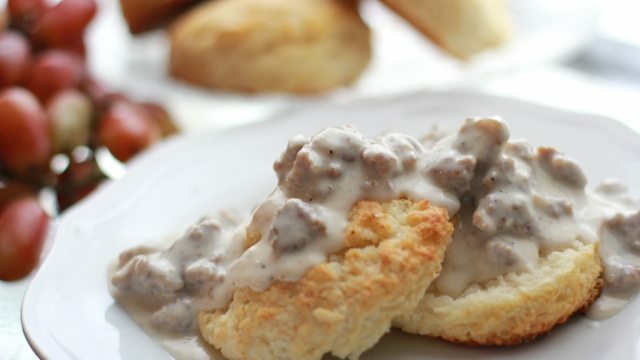 Absolutely perfect for soaking up some creamy sausage gravy! If you’ve never made sausage gravy before, you’re going to amazed at just how easy it is. For some reason, I’ve always thought it was a process, but it literally comes together in minutes with minimum ingredients. You can certainly use your favorite sausage instead making your own but I was all out. This turkey sausage recipe is pretty straight forward with just ground turkey and spices. Give or take a few spices and it will still turn out fabulous. Heck you could even throw in a bit of maple or make it spicy with some cayenne! It’s best if you let the sausage sit overnight for maximum flavor. Serve with hash browns and chilled fruits. Watch me make this southern sausage gravy from start to finish! In a large bowl add ground turkey and olive oil. Mix together all of the seasonings in a small bowl. Pour seasonings over ground turkey and mix until well distributed. Fry up a small piece of the sausage mixture to make sure it is flavorful and adjust seasonings if needed. In a large deep skillet, add in sausage and cook over medium heat until browned. Break the sausage up as it cooks. Drain the excess fat from the pan if needed, but leave about a tablespoon of fat in the pan. Sprinkle flour over cooked sausage a little at a time until all of the flour has been absorbed. Continue cooking the sausage for a couple more minutes to cook out the flour taste. Gradually add the warm milk,stirring constantly. Allow gravy to come to a light simmer while stirring and then reduce heat. Continue stirring until desired consistency is reached. Season to your liking with salt (if needed), black pepper, thyme and sage to bring out the flavor of the gravy. When tasting the gravy for seasoning, be sure to include a bit of the sausage in your taste test to prevent over salting the gravy. Serve piping hot over homemade biscuits. Adding smoked paprika gives the sausage a wonderful smokey flavor, however it can slightly tint the white gravy and make it a bit cream in color. This usually isn't an issue if you allow the sausage to sit overnight. I don't mind a creamed colored gravy but if you're going for presentation I'd omit the paprika to keep the gravy white in color. You’ve made Turkey so much better for my family. Now that we don’t eat pork or beef anymore your website have been more than helpful. Do you have any plans on trying fish? I just made your sausage gravy, except I used store bought sausage. Other than that followed your instructions — yummmmm! I just wanted to stop by and say hi and thank-you for all the good recipes you share. I go all over the internet looking for good recipes but since I found your website, I go straight to yours. I especially love your Banana Bread recipe, I cant wait to make it for Christmas- it is “thee best!!! My family didn’t like this gravy. I made it according to directions, leaving out the paprika. My kids (ages 8 and 11) said it “tastes funny” and asked “why is it sweet?” My husband said it was “too spicy” but he thinks everything with a little spice is too spicy. It didn’t taste at all like any sausage gravy I have every had. I won’t make this again. I’m so sorry this didn’t work for you. Hmmm… I’m not sure why the gravy tasted sweet since there isn’t anything in the gravy that would make it taste sweet. You should try the biscuit recipe that Hardee’s uses for its biscuits. yummmmmmmmmmmmm! can this gravy be made ahead of time and either refrigerated or frozen? Hey Mo, I don’t see the video am I missing it? Yep it’s at the bottom.